During our Honeymoon, my wife, Nancy and I traveled around Italy. One day we were driving through Tuscany and saw in the distance what looked like New York City. Being New Yorkers, we were immediately drawn to it and headed that direction. Before long we arrived in the picturesque town of San Gimignano, sometimes referred to as "Medieval Manhattan", because of it&apos;s many ancient towers. It was raining that day and I took photos of the fascinating architecture, knowing one day I would paint it. 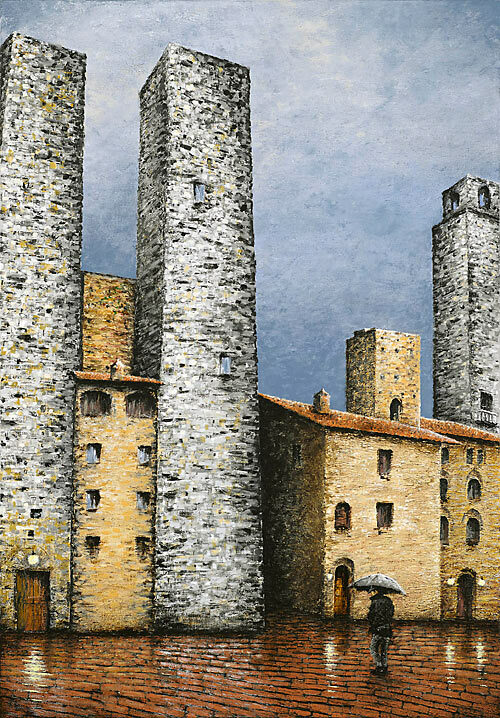 San Gimignano nella Pioggia is being offered as a giclée on canvas print, with a limited production of 75 signed and numbered prints. The canvas measures 18" x 26".